If you only had about 14 days from birth until death, what would you do with your time? If you were a flea you’d be doing two things, eating (biting people and pets) and laying eggs. 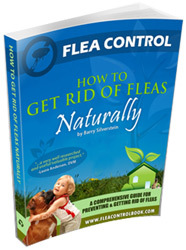 A flea’s mission is life is to eat and reproduce, which is not unlike some humans I’ve encountered. With a life span that short, they have nothing to lose, and will not hesitate to bite you without your permission. The key is to create an environment very, very uninviting. Use natural products in and around your house to make these little resilient bugs prefer to be somewhere else.